Pruning apricot trees - This time I'll be using the sharpest high quality pruners I can find and heavy duty anvil loppers to reduce the 'enemy's' (the poor Apricot tree) height. I have left him in peace for the last two years, un-pruned and untouched in my very own garden. Now I think the time has come to show him who's boss. In his defense I will say, in season he delivers amazing fruits! but who can pick them when they are at that height? It's time for the way of Samurai. Like any other deciduous fruit tree, apricots should be pruned only after it has shed all its leaves. Prune only when the tree is naked. This will usually take place in late winter. See picture on the right. Where to begin? Start from the tree's center. The shape of my apricot tree is really not ideal, but it still has the cup shape. So to be able to begin the pruning process I always prefer to start from the center. Why? well, first of all, you should always strive for an open center so the tree can get the most sunlight and air circulation - both important for the trees general health. 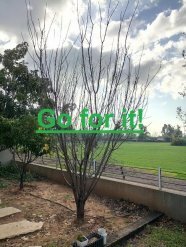 Second, an open center is a great and easy way to care for your apricot tree throughout the year, and as you prune your way to the center you'll also get a better look at the tree's skeleton - which we will talk about shortly. Which branches should I prune? Start by removing the dead branches. You'll easily recognize them, their color is gray, they have no buds and very likely that they can be broken off by hand. Dead branches, unlike live ones, have no flexibility and can be snapped off. Next to be pruned are the crossing branches, those that grow cross the tree in the middle, or cross one or two other branches. Last to be pruned are all the branches growing towards the center. Remember the aim is to keep the center clean and open. What next? Now we prune the tree's height, which has clear benifits: 1. Low hanging fruit are easy to pick, and 2. low branches are easy to train and remove. 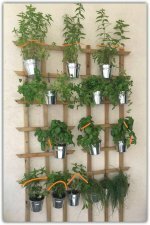 And, it gets even better, here comes one of the biggest benefits of pruning, the social part. 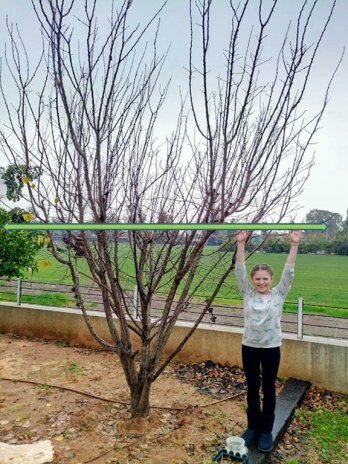 Keeping a trees height rather low is perfect for kids and the disabled, allowing them to reach the tree both in terms of caring for it and for fruit picking, which is fun for everyone, regardless of their height. Another great thing about lower trees, is that at lower heights they produce significantly more fruits. In a minute I'll show you how low you should go, but know this: the best fruits will always grow on young new branches, so by pruning the tree low you'll get lots of young branches and soon after lots of apricot clusters (so much so, that you will probably need to read up about fruit dilution). This is my daughter Roni (our little Samurai) She's 5 foot tall, and at the point where her raised hands reach is where you should prune. 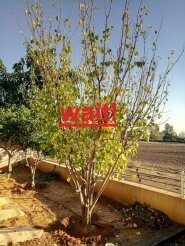 From that point you will soon see young new branches grow and become covered with flowering buds that shortly after will become apricots. Pruning apricot trees is easy. And I told you I' would use my Samurai method. Now you can clearly see the cup shape of the tree. 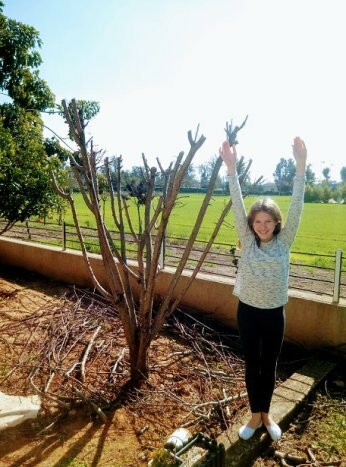 The pruned stems are all pointing out, the tree's centre is clean of crossing and dead branches, unnecessary twigs have been removed, even dried rotten leaves that where on the main trunk's base have been removed. There is now no reason to touch the tree at least for the next two seasons. Beside routine maintenance of course. I hope you enjoyed learning about pruning apricot trees. Please don't forget to use a quality pruning sealer on cut stems wider than a finger (1/2 inch). It will reduce exposure to fungus, and cold weather, and prevent heat burns. Pruning apricot trees isn't easy, but in few weeks you'll be rewarded. 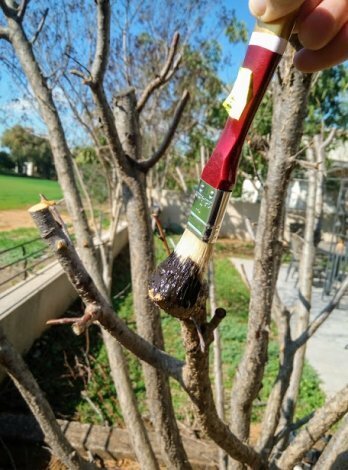 I know that there are differing opinions regarding the use of pruning sealer, but in this case I have decided to use it through to the season. The apricot's skeleton is naked and it now has a lot of new cuts that are exposed to the sun, diseases and all kind of harms. I would definitely want to protect the expose cuts from potential cold burns and the sun is still not so hot and burning (it is after all only late winter where I am). 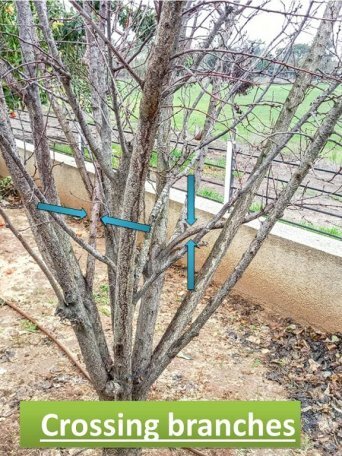 So the pruning sealer will protect my apricot tree, and by the time the sun gets harsher the tree will be covered with new leaves to provide shade to it's not so new wounds.